When the International Student Organization (ISO) began last semester at the American Samoa Community College (ASCC), its stated purpose was to promote unity among all students at the College regardless of race, color or ethnicity, encourage students to share their values and customs with each other, encourage international students to participate in school activities, reach out to help the community, and provide a scholarship opportunity for non-Pell international students to further their education at ASCC. As the fall 2014 semester draws to a close, the ISO can take pride in having accomplished two of these goals, first through a successful clothing drive on behalf of the needy, and also through the awarding of their first-ever scholarship to benefit a non-Pell ASCC student. Over several weeks, the ISO mounted a clothing drive on and off the ASCC campus, which resulted in a substantial collection of second hand clothes they donated to Love Your Neighbor Ministries. The Ministry director, Mrs. Carol Baqui, accepted the donation at a small ceremony on the ASCC campus in late November. “We’re glad to help Love Your Neighbor Ministries because not only do they serve children under the care of Social Services, but also the men and women in the Tafuna Correctional Facility and teenagers at the Juvenile Center,” said ISO advisor Mrs. Tala Leo. At the ceremony, Mrs. Baqui shared with the ISO that the Ministry occasionally travels to Tafaigata Prison in Samoa to provide clothing for those in need. “Knowing that those in unfortunate circumstances will benefit makes the time we spent on the clothing drive worthwhile, and we look forward to working again with Love Your Neighbor Ministries in the future,” emphasized Mrs. Leo. Other recent ISO projects have included a food drive for Hope House residents, and a poetry and art poster competition to promote unity among the diverse ethnic groups that make up the ASCC community. The ISO also offers academic support and language tutoring for students challenged at English. Knowing well the difficulties faced by students who are not US citizens or nationals, and therefore cannot receive the Pell grant or other federal financial aid, the ISO has long sought to establish its own scholarship, a goal which has come to fruition this semester. Candidates for the $500 scholarship must be non-Pell international students enrolled for the semester at ASCC following the one in which they apply. Applicants must have a cumulative grade point average of at least 3.0, and the final selection is based on an essay each candidates submits, stating why he or she deserves the scholarship. 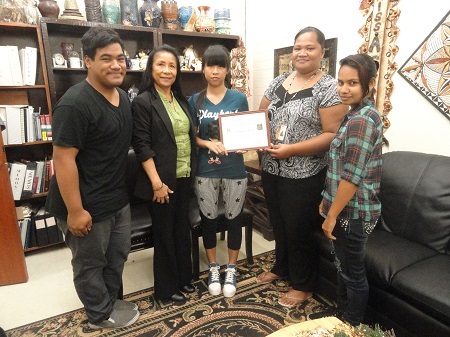 The ISO recently announced the recipient of its first scholarship as Ms. Jiaying Wang of Pava’ia’i. The daughter of Zhong Bin Wang and Xiang Ying Li, Jiaying is an alumnus of Manumalo Baptist School, currently majoring in Business Management at ASCC. Jiaying hopes to become a successful business woman in the future and plans to go off-island to further her education after graduating from ASCC in spring 2016. “We sincerely congratulate Ms. Jiaying on all her academic achievements and we hope the scholarship will help her move forward in reaching her goals,” said Mrs. Leo. “As an advisor, I’m very proud of my officers and my co-advisor Ms. Maria Magalasin,” continued Mrs. Leo. “The ISO officers worked extra hard to make this scholarship and all our other goals a reality. “I thank everyone who donated to our clothing drive and also supported us this semester like Dean of Student Services, Dr. Le’i, the staff, faculty and students of ASCC and the community at large. We wish you all a wonderful Christmas and a prosperous New Year.” The ISO President this semester is Patricia Tofilau, the VP is Ron Luardo, the Secretary is Mau Brown and the Treasurer is Faafouina Fruean. For more information on the ISO, contact Mrs. Tala Leo at 699-9155, ext. 461.